The photo shown on the left is the best photograph we have of the houses. Numbers 37 and 39 are in the three storey building with dormer windows in the roof. It was taken looking towards the bottom end of the street. Click on the thumbnail shown on the right below to see the full image. We would love to hear from anyone who has any other photos! When local people described these two houses to us we were confused at first by what they told us. They mentioned that ‘they were a pair of houses’ or ‘they were ‘double fronted’. It took us some time to realise that they meant that there was only one door onto the street and as you went through that door there were two separate doors leading to the two separate houses. William Clark the then owner died on 17th January 1800 aged 74. The Rent Roll of 1809 shows that Daniel Hathway was the owner of the property. Daniel died aged 63 and was buried on 4th May 1809. The Land Tax records from 1812 to 1821 show Betty Hathway as the owner and occupier of the house. Betty died about 1821. In her will she left various bequests: 19 guineas to her daughter, Hester, wife of Richard Greenham, and the same amount to her daughter, Mary, wife of Richard Scarlett, and £10 each to her grandson, William Longman and grand-daughter, Elizabeth Longman. She also gave to Ann Stephens, her oldest bed and oldest bedstead and some of her oldest bedclothes and oldest wearing apparel. The rest of her goods and chattels were to be sold and the profit shared, one third to Hester, one third to Mary and one third shared between John Longman, William Longman and Elizabeth Longman. There was no mention of Betty owning property so we assume that Daniel had left it for her to hold during her lifetime and made some provision for its future after her death. The 1822 Land Tax record shows the house was owned by ‘late Betty Hathway’ and occupied by John ‘Maishman’. The spelling of John’s surname varies in the land tax and rent roll records. We think it likely to be John Maishment, a tailor. The 1823 Land Tax record shows that the house has been acquired by Betty’s son-in-law, Richard Scarlett and still occupied by John Marshman. It is interesting to note that the 1831 and 1832 Land Tax record shows that the house was owned by ‘Richard Scarlett etc & John Longman’. It was still being occupied by John Marshman at least up to 1832. In the 1840 Tithe Survey it was Plot 137 – a house and garden owned by Richard Scarlett and occupied by George Virgo. This gives the impression that it was a single house, but it seemed to have been used as two houses. By 1883 when the house was put up for auction it was described as one house but the description makes it clear that it was used as two separate units. ‘a large and convenient dwelling house and garden situated on the east side of St Mary Street in the Town of Thornbury containing two front and two back rooms, two pantries, four bedrooms and two large attics with garden and pigsty in the rear. Also all that productive garden ground adjoining having frontage to a good road and well situated for the erection of two or three cottages. The lot is in the occupation of Ambrose Withers and John Horseman as weekly tenants‘. Richard Scarlett was a solicitor and he owned several other properties in Thornbury. We know from the Rate Books that the house (or houses) in St Mary Street continued to be owned by Richard Scarlett until his death in 1881 when he was aged 90. There was an auction in 1883 when the Trustees attempted to sell of Richard’s properties, however the Rate Books show that they failed to sell this property and it continued to be managed by his Trustees until at least 1905. The 1910 rate book indicates that it had been owned by Maria Honeyborne, but her name has been crossed out and replaced by Mrs Stutchbury. We suspect that these persons were Richard Scarlett’s Trustees, as the Stutchbury’s were connected by marriage to the Scarletts. We have also seen a document referring to a conveyance dated 26th June 1919 between what appears to be Richard’s Trustees (namely: Mary Sarah Scarlett Kidd, Elsie Gertrude Scarlett Stutchbury and Helen Maud Scarlett Henderson) and Helen Garfield Grace. This conveyance seems to show that the property was sold to Helen Garfield Grace for £110. Note in August 1936 Helen Garfield Grace sold part of the gardens facing Rock Street to the Postmaster General for the purpose of building a telephone exchange. 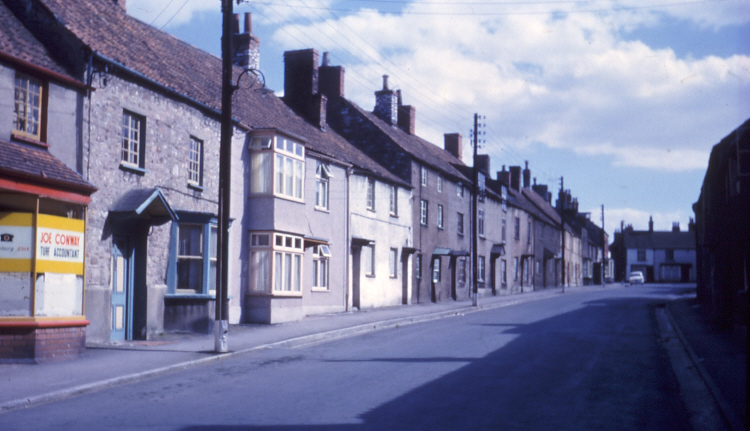 She sold the two properties to the Thornbury District Council on 20th February 1963. The Council demolished it, along with adjoining properties, for the development of a new library.